Mini excavators give operators the ability to dig and move ground materials while taking up the fraction of the space. 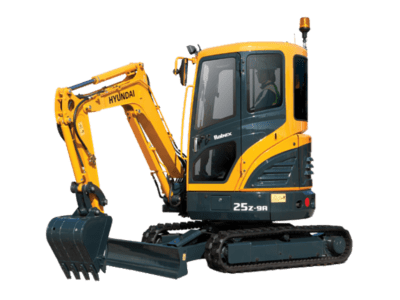 A mini excavator sometimes called a compact or a small excavator, are popular because they can fit into narrower spaces than full-sized excavators, which many people call diggers, bobcats, or backhoes. Like larger models, mini excavators have a boom, a dipper or stick, and a bucket and cab on a rotating platform called the house. The dipper is connected to an elbow that holds and controls the bucket. The house sits on an undercarriage or frame with tracks or wheels. Most models can rotate 360 degrees, and you can replace the bucket with several different attachments. A hydraulic excavator uses hydraulic fluid, hydraulic cylinders, and hydraulic motors. Most mini excavators are hydraulic, but you may occasionally see a cable-operated excavator that uses winches and steel ropes to make the same movements. The smallest excavators can fit through a doorway, and they can lift from 3,500 to 18,500 lbs. The largest full-size models can lift more than 180,000 lbs. Mini excavators are often used for light demolition, material handling, landscaping, stump removal, plowing snow, and construction. In 1882, a British company, Sir W.G. Armstrong & Co., produced the earliest hydraulic shovel. It used water instead of the hydraulic fluid commonly used today. The first fully revolving machine was created two years later by an English company, Whitaker & Sons. Over 100 steam shovels were used to dig the Panama Canal in 1904, and companies started producing machines powered by gas and oil instead of steam in the 1920s. Yanmar, a Japanese company, founded in 1912, designed the first mini excavator in 1968. It was called the YNB300, and it was introduced in Japan in 1969. Bobcat started was named Melroe Manufacturing in 1947. It's been a leading manufacturer of compact machinery since 1986 when it introduced the first mini excavator in the United States. Bobcat is even a popular nickname for mini excavators. Open cab mini excavators don't have a closed space for the driver like enclosed cab mini excavators. Most mini excavators use diesel engines, and the power the engine provides moves the wheels and arms. The boom attaches directly to the house or cab, and it supports the arm and an attachment like a mini-excavator bucket. There are three different configurations: swing, fixed, or articulating booms. A swing boom sits off-center to let operators see where they're digging better. Only an excavator using a fixed boom can dig directly in front of the house or cab. An articulating boom lets the arm stay parallel to the excavator. There are also three tail configurations. A Zero Tail Swing or ZTS mini excavator has a house that doesn't overhang its tracks and allows unobstructed 360-degree rotations. Mini excavators have steel or rubber tracks. The undercarriage sits under the house and attaches to the tracks. Excavators with fixed undercarriages are wider than models with retractable undercarriages. Bobcat holds most patents related to mini excavators since they were the first business to sell them in the United States. However, some models are patented by other companies and individuals. Individual accessories, seat designs, GPS systems, and other features also have their patents. Since mini excavators are popular all over the world, new patents appear often. In today's market, the demand for mini excavators in Japan and Europe is still higher than the demand in North America. However, sales have been steadily increasing along with the number of manufacturers offering mini excavators. Here are some of the most popular manufacturers and models. 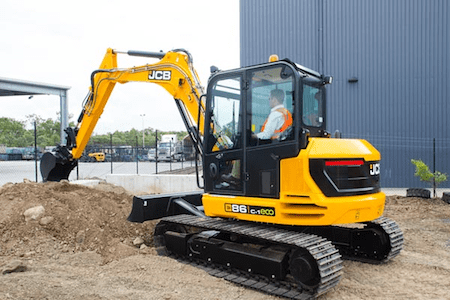 JCB has been producing both full-sized and compact excavators for decades. You can choose from 10 models with large front and side windows for increased visibility and narrow booms and dippers for better productivity and maneuverability. The 67C-1, the 86C-1, and the 85Z-1 are all powered by new Kohler diesel engines. They're more efficient than previous designs, and they produce low levels of pollutants. They have revised H-design undercarriages, robust steel body panels, and spacious operator areas as well. Their sturdy swing bracket designs have widely spaced bearings to prevent wear. They also use a new graphite-based pin-and-bush design. Greasing intervals of 500 hours reduce daily maintenance and operating costs. A roto/tilt function makes them ready for use with several rotating and tilting bucket mount systems. Pressed steel engine covers deliver sturdy component protection and easy repair. The cab structure can be tilted by 30 degrees for easy access to hoses and hydraulic components for repair and maintenance. Also, the machines have removable side skirts and in-fill panels for optimal service access, along with better access to the cooling pack. 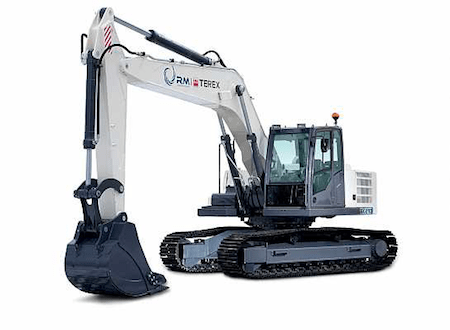 The Terex excavator line was first distributed by Schaeff in Germany. Terex Corporation purchased Schaeff in 2002, and many of the company's compact excavators are still engineered and manufactured in Germany. Many of this company's mini excavators have a high power-to-weight ratio for tough jobs in small spaces, and they can work efficiently in a wide range of temperatures. Hitachi built its first hydraulic excavator, the UH03, in 1965. Since then, the company's construction division, Hitachi Construction Machinery or HCM, has sold more than 2.5 million excavators all over the world, from compact excavators to mining-sized machines. You can choose from 23 different mini excavators. Safety features include TOPS, a tip-over protective structure, and FOPS, a falling object protective structure. Exhaust and noise emissions are low for urban and nighttime construction. 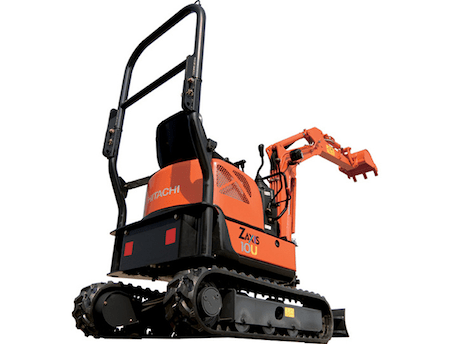 The Hitachi ZX10U-2 mini excavator is a compact zero tail swing model with a Yanmar engine and an adjustable undercarriage. It weighs 2,447 lbs, and it's 9.7 ft long and 4.8 ft wide. The water-cooled three-cylinder, four-cycle injection diesel engine has 12.7 horsepower and 2,100 rpm. The top speed is 2.5 miles per hour, and the minimum travel speed is 1.3 miles per hour. 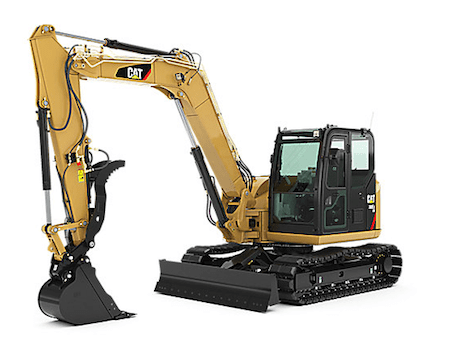 This mini excavator has a 4.2-gallon fuel tank and a 5.6-gallon hydraulic system. Its tail swing radius is just 2.7 ft, so the tail of the house doesn't overhang the tracks. The retractable undercarriage makes it possible to take the excavator through gates and narrow passageways. The Hitachi ZX10U-2 has roll bars but no canopy or cab. There's a seat belt, a 12-volt outlet, and a work light, but it doesn't have air conditioning. It uses a hydraulic pilot system combined with mechanical controls for its boom, arm, swing, and bucket. The undercarriage has welded track frames and rubber shoes to protect pavement and landscaped job sites. There are three track rollers on each side of the undercarriage. In 1947, Hyundai, also called Hyundai Construction Equipment, started as a general contractor to help develop and industrialize Korea after World War II. It became a multibillion-dollar conglomerate, and it introduced the first two excavators to the North American market in 1989. Today, the company offers more than 50 different models. The Hyundai Robex 25Z-9AK has a comfortable cabin and a strong frame. A safety lever keeps operators from leaving the cabin without turning off the excavator engine. Wrist rests, ergonomic joysticks, and lots of leg room keep workers comfortable and productive. A sophisticated monitoring system keeps track of oil pressure, battery levels, engine coolant temperature, and more. The Robex also offers smooth responses, easy maintenance, and extended life. Komatsu was founded in Japan in 1921. It entered the North American hydraulic excavator market in the late 1960s with the H-Series. 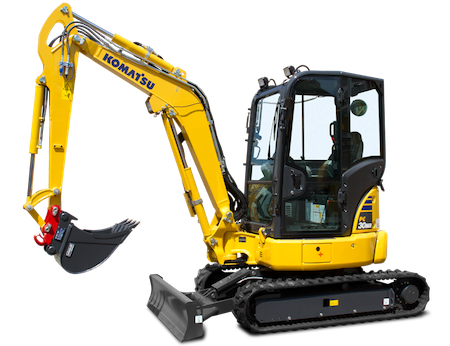 Today, Komatsu hydraulic excavators are popular all over the world over for their advanced technology and convenient controls. The latest models offer sophisticated electronics, easy maintenance and troubleshooting, and enhanced comfort. KOMTRAX, Komatsu's machine monitoring system, gives operators detailed information about fuel efficiency and general performance. Most models have backup cameras similar to the cameras on many cars and trucks for better visibility and safety. They also have a Closed Center Load Sensing or CLSS hydraulic system for lower fuel consumption and response time. Many models also have a quick arm return circuit for better speed and efficiency. Caterpillar Inc., sometimes called Cat, was founded in 1925. Today, it's one of the largest heavy equipment manufacturing companies in the world. 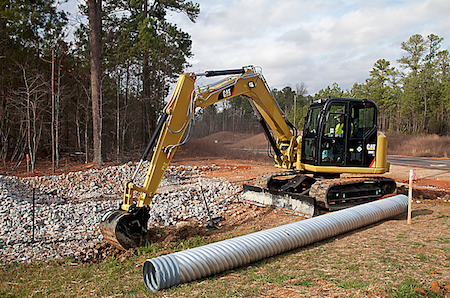 The compact Cat 308E2 CR has a lower turning radius and fuel consumption rates than previous models. It also has better lift capacity, a comfortable suspension, more space for the driver, and ambient cooling capabilities. It even has armrests. Load sensing saves fuel and provides power on demand. The COMPASS Control Panel lets operators adjust auxiliary hydraulic flows, activate auto idle for improved fuel efficiency, and use a security system to protect the vehicle. Information from pitch and roll sensors helps with grading and level trenching, improving accuracy and productivity. There's also a rear-view camera for extra safety. Bobcat is based in North Dakota, and its mini and full-sized excavators are popular all over the world. 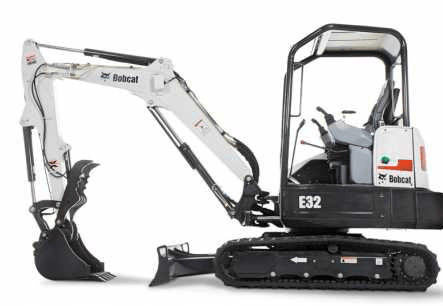 The Bobcat E32i T4 Compact Excavator is available with a standard configuration, with a long arm, or with an extendable arm. Models with long and extendable arms have turbocharged engines to cope with the additional operating weight lb. The cab of a mini excavator should reflect the type of job the unit will be used for, as well as the time of year. Mini excavators come with open or enclosed cabs. Enclosed cabs are more popular because they can shelter operators from inclement weather and flying or falling debris at construction sites. However, mini excavators with open cabs are less expensive. They work best when operators are underneath a roof or in nice weather. Conventional tail swing excavators are harder to use in tight places than minimal tail swing excavators. ZTS or zero tail swing models need the smallest amounts of space. Steel tracks are more durable than rubber tracks, and they provide more traction. However, rubber causes less surface damage to pavement and landscaped areas. A mini excavator with a standard fixed undercarriage may be too wide for some spaces. Retractable undercarriages have hydraulic systems that retract and expand for maneuverability when you need it and stability when the excavator is stationary. Before you decide on a mini excavator for your business, you should consider the dig depth, operating weight, arm force, dump height, maximum height, and power kw rating. When someone is injured on the job, employers and employees have to deal with extra expenses. Workers' compensation insurance expenses will rise, and you'll have to assign additional work to the remaining employees or train a temporary or permanent replacement. While receiving workers' compensation payments can reduce lost income for an injured employee, it won't cover all their living and medical expenses. You could have to defend yourself from a lawsuit or pay a large settlement. Make sure mirrors are clean and properly adjusted. Make sure the controls and propulsion system are working correctly. If needed, call your local utility company to have the job site marked for underground lines or structures. Only operate an excavator if you're sitting in the seat and in full control. Reduce speed when working on rough terrain or in areas without lots of space. Carry the bucket close to the ground during transport to increase visibility and stability. Select a route that's as flat as possible. Don't try to move loads that exceed the operating weight capacity. Travel directly up slopes instead of diagonally. Always park on a level surface with the bucket lowered. Place soil and debris as far away from the mini excavator as possible. Never dig underneath a mini excavator. Don't dig underneath structures like sidewalks without a support system to prevent a dangerous collapse. When loading trucks, don't swing the bucket over the cab of a truck. Don't try to clean the bucket by striking the ground or another object. Wear a helmet, ear protection, and a respirator or face mask when needed. The lifting capabilities of a mini excavator are determined by its hydraulic capacity and tipping capacity. Hydraulic capacity is the point when a mini excavator stall or runs out of hydraulic power. Tipping capacity is the point when a mini excavator starts to tip over. Manufacturers test excavators to find out how much weight they can lift safely at various heights and distances from the center of the machine. Then, they create lift charts with the information and post them in sight of the operator, on the canopy, the cab roof, the hood, or the window. Mini and full-sized excavators can lift more when the bucket is closer to the wheels or tracks. In steep or slippery conditions, use the boom and arm to grab the ground for extra stability when moving up. Placing dirt beneath the tracks or wheels can help keep a mini excavator level. Before operating a mini excavator, inspect the work site for runoff or erosion and make sure people and objects like hand tools are far away. 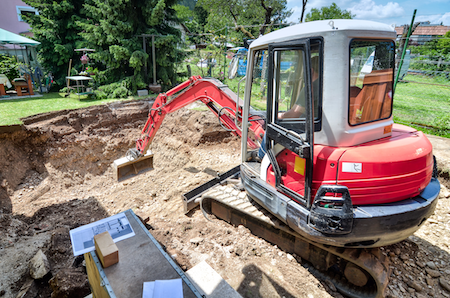 Even when you opt for a mini excavator rental for a temporary job, you should make sure your employees are properly trained and familiar with all laws and regulations. Make sure workers review the instruction manual before operating a mini excavator. All operators need drivers' licenses, and most employers also require at least a high school diploma. If a business doesn't provide in-depth training, take a training course to make sure you can operate a mini excavator safely. Many employers require a written or practical test to make sure you understand company rules. You can choose a class that lasts for a few weeks or an apprenticeship that lasts for a year or more. Some businesses guarantee jobs for people who complete a training course. How Do I get a Mini Excavator Rental? Contact BigRentz to rent a mini excavator for your business' next project. There are more than 8,000 locations in the United States with a wide selection of construction equipment. Delivery and pickup are available for a small fee, and any maintenance you need is free. BigRentz can also help you make sure that workers operate mini excavators safely. What Mini Excavators Are Available? How Long Can I Rent a Mini Excavator? BigRentz offers rentals from eight hours to a month long. A one-week rental is five eight-hour shifts over seven days, and a month is the same as 20 eight-hour shifts over 28 days. By renting, you can get the tools you need in a day or two instead of spending weeks or months to research the best purchase. Renting won't affect your company's credit rating as much as investing in an expensive item like a mini excavator, and you can choose from a variety of machinery. You won't have to pay for storage, maintenance, or repairs. You can also rent equipment before you buy your own to test it in practical conditions. If your job site is in BigRentz's local delivery range, usually about 25 to 50 miles from the nearest location, you'll only need to pay a flat delivery fee. However, you could have to pay an extra mileage fee if your job site is outside that range. Business owners can usually get the equipment they need in just a day or two. All equipment is delivered with a full tank or a full battery charge, including mini excavators. You should replace the fuel you use before your rental expires to avoid additional charges. Mini excavators are ideal for landscaping, residential construction, and similar tasks. They can fit in small spaces and handle rough terrain. Contact BigRentz at (888) 325-5172 for help renting the best mini excavator for your business.